Local volunteers host a packing party. MANSFIELD—Several local businesses will serve as collection sites this year for the Samaritan’s Purse Operation, Christmas Child. Organizers say it is the world’s largest Christmas project of its kind. 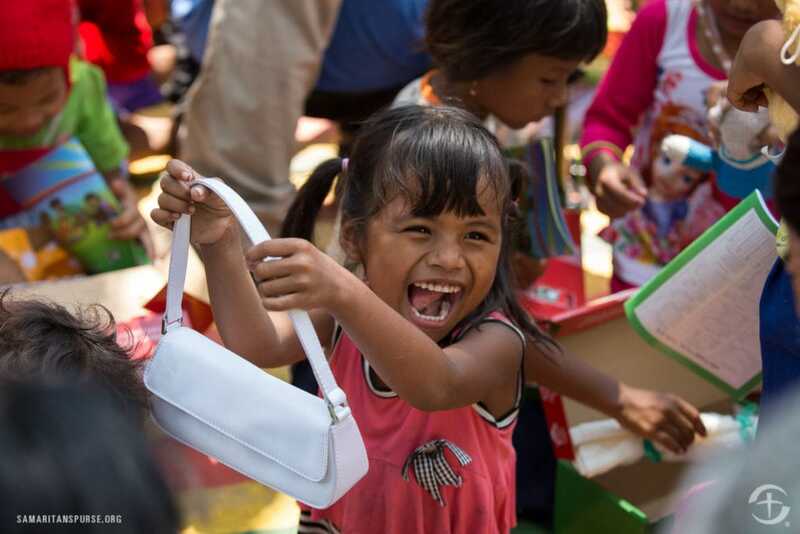 Operation Christmas Child is a project of Samaritan’s Purse, an international Christian relief and evangelism organization headed by Franklin Graham. The mission of Operation Christmas Child is to demonstrate love in a tangible way to children in need around the world. It works together with local churches worldwide to share the good news of Jesus Christ. During National Collection Week, Nov. 14 – 21, Best Southwest residents will donate shoe-boxes filled with items less fortunate children need and desire. In past years, they have been filled with school supplies, hygiene items, notes of encouragement and toys. This year, Regional Director Matt McCelland, says he hopes that area residents can contribute more than 45,779 gifts. This will go towards the 2016 global goal of reaching 12 million children. Morning shoebox distribution through Jesus Loves You Church in Thmey village, Svay Rieng province, Cambodia. For more information on how to participate in Operation Christmas Child, call 817-595-2230. By going online to give the suggested donation of $7 per shoe box gift, participants can follow their box to discover where in the world it will be delivered. They can also pack a shoe box gift online and even upload a photo and note of encouragement. Since 1993, Operation Christmas Child has collected and delivered more than 135 million gift-filled shoe-boxes to children in more than 150 countries and territories. For many of these children, the gift-filled shoe box is the first gift they have ever received. Mon, Nov. 14: 10 a.m. – 4 p.m.
Tue, Nov. 15: 10 a.m. – 4 p.m. Wed, Nov. 16: 12 p.m. – 8 p.m.
Thu, Nov. 17: 10 a.m. – 4 p.m.
Fri, Nov. 18: 12 p.m. – 7 p.m. Sat, Nov. 19: 10 a.m. – 4 p.m.
Sun, Nov. 20: 1 p.m. – 7 p.m.
Mon, Nov. 21: 10 a.m. – 3 p.m.
Mon, Nov. 14: 10 a.m. – 3 p.m.
Tue, Nov. 15: 12 p.m. – 2 p.m. Wed, Nov. 16: 2 p.m. – 4 p.m.
Thu, Nov. 17: 10 a.m. – 3 p.m.
Fri, Nov. 18: 6:30 p.m. – 8 p.m. Sat, Nov. 19: 10 a.m. – 12 p.m.
Sun, Nov. 20: 12 p.m. – 2 p.m.
Mon, Nov. 21: 9 a.m. – 11 a.m.
Mon, Nov. 14: 10 a.m. – 2 p.m.
Tue, Nov. 15: 11 a.m. – 2 p.m.
Thu, Nov. 17: 12 p.m. – 5 p.m.
Fri, Nov. 18: 12 p.m. – 6 p.m. Sat, Nov. 19: 10 a.m. – 2 p.m.
Sun, Nov. 20: 1 p.m. – 6 p.m.
Mon, Nov. 21: 10 a.m. – 8 p.m.
Mon, Nov. 14: 8 a.m. – 8 p.m.
Tue, Nov. 15: 8 a.m. – 8 p.m. Wed, Nov. 16: 8 a.m. – 8 p.m.
Thu, Nov. 17: 8 a.m. – 8 p.m.
Fri, Nov. 18: 8 a.m. – 8 p.m. Sat, Nov. 19: 8 a.m. – 4 p.m.
Sun, Nov. 20: 3 p.m. – 9 p.m.
Mon, Nov. 21: 8 a.m. – 11 a.m.
Mon, Nov. 14: 2 p.m. – 6 p.m.
Tue, Nov. 15: 5 p.m. – 7 p.m. Wed, Nov. 16: 5 p.m. – 7 p.m.
Thu, Nov. 17: 2 p.m. – 6 p.m.
Fri, Nov. 18: 5 p.m. – 7 p.m. Sat, Nov. 19: 12:30 p.m. – 2:30 p.m.
Sun, Nov. 20: 9:30 a.m. – 1:30 p.m.
Mon, Nov. 21: 11 a.m. – 2 p.m.